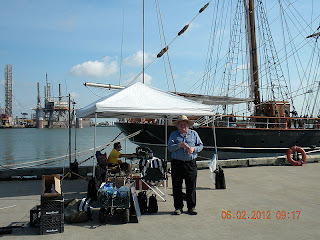 Museum ships weekend was last weekend. 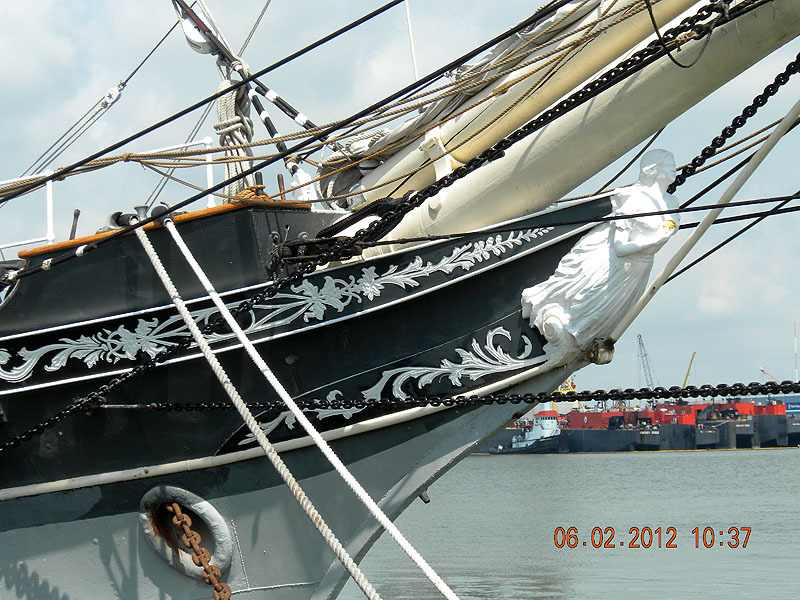 N5E activated the Tall Ship Elissa. 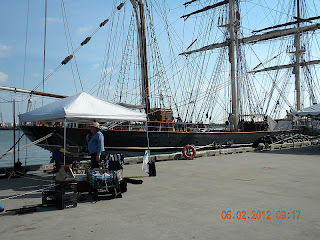 To our knowledge this was the first activation of the Tall Ship Elissa. We would like to formally thank, in no particular order; the Galveston Historical Foundation; The Texas Seaport Museum and Becky Jones of the Texas Seaport Museum. Becky thank you for getting us permission to operate and put the Elissa on the air! We had to set up and tear down the station each day. The Elissa is currently moored at the pier next to her normal berth. And The Texas Seaport Museum had their largest gala scheduled for Saturday evening. As the band was setting up for the Plank holders event, the RFI being generated by their amplifiers made all bands un-usable. But, none the less, we had a great time. We made in excess of 600 contacts during the two days of operation. The wharf was real hot. Thankfully, we had a canopy to operate under. Some stations take breaks to change operators, which we did too. But, we also took breaks to move the table, with the station, back into the shade! Thankfully we had a good breeze some of Saturday and all of Sunday. I took some photos of the station, the Elissa and our location along with a couple of short videos. Except where noted all of the photos and video on this blog were shot by myself, ad5wb. 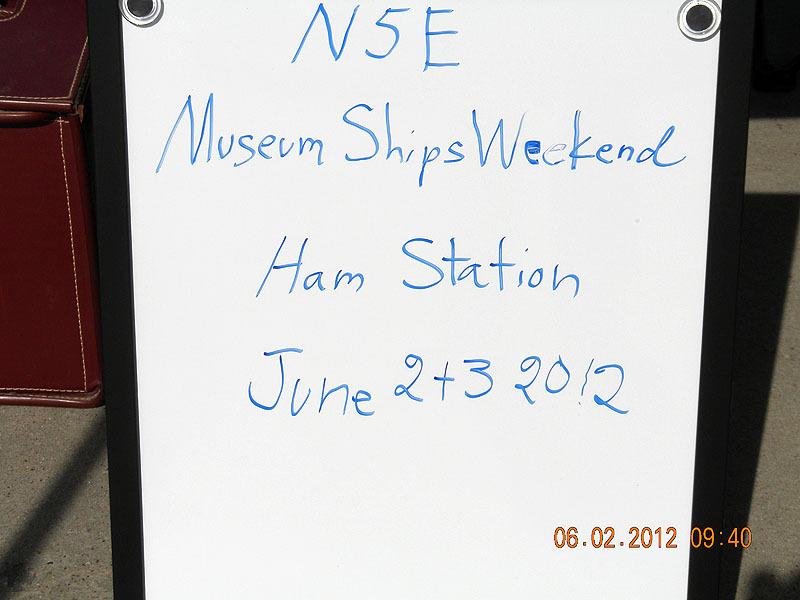 Anyone who wishes to use them to promote museum ship weekend, The Elissa and ham radio may do so by giving proper credit for the source. Please, just you let me know you are using them. 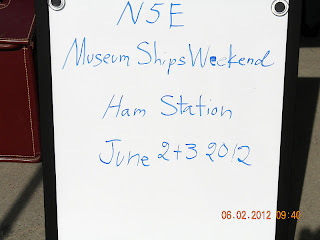 Because the Elissa is a working ship with visitors, we had a sign noting what we were doing. 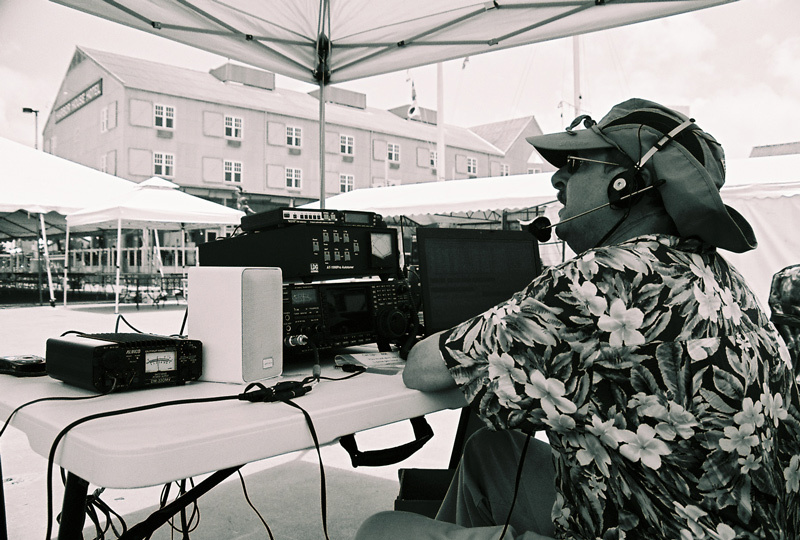 We spoke with several people over the weekend about ham radio. 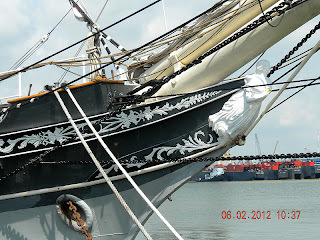 The beautiful figurehead on the Elissa. A view of the station and The Elissa. A closer view of the station. 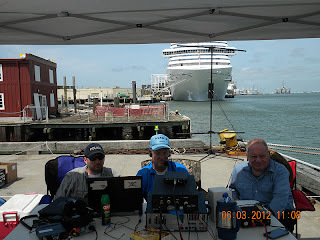 Jeremy, K0JCC is operating, Dominic, N5TCB is in the foreground. If you look closely you will see a 2 meter beam that we used to check into a local 2 meter net that was set up to give local operators the opportunity to work us. There were four of the five Texas ships on the net: the USS Texas, the USS Cavalla, the USS Stewart and the Elissa. The Lexington was too far from us to join this net. The BVARC people put together a worked all Texas Navy Certificate for this event. Well done guys! 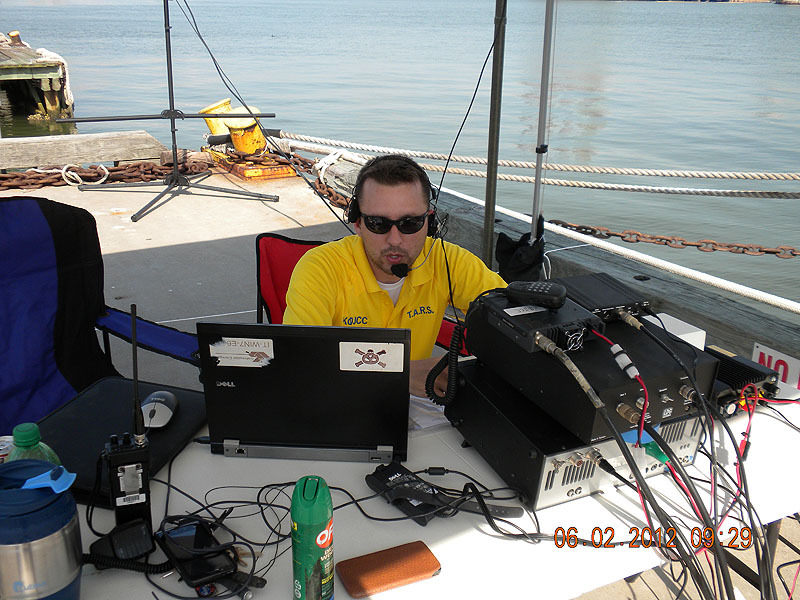 Jeremy, K0JCC operating. The station was made up of an IC 756 Pro 2 running at 80 watts, an LDG tuner just for safety, and a Transworld vertical antenna. 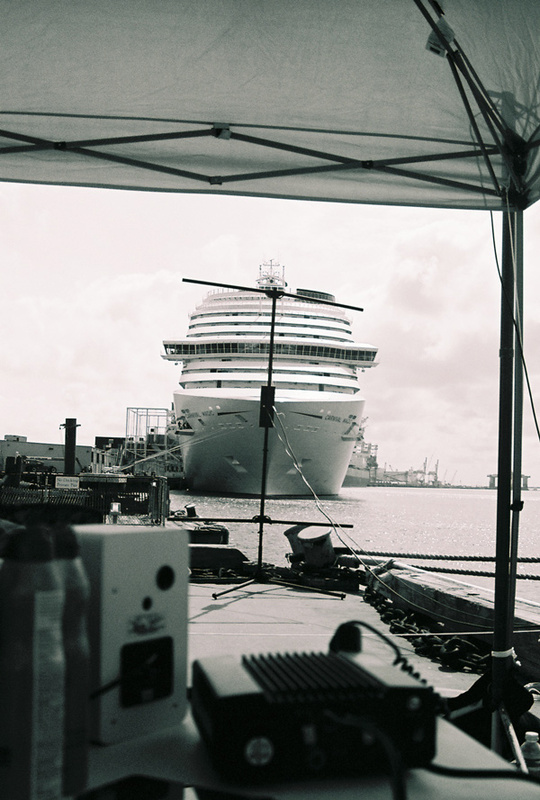 The Elissa is in the background. She is an absolutely beautiful ship. 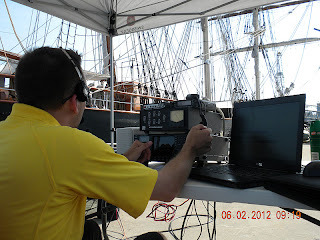 Another view of the station with Jeremy operating. You can just see the base of the Transworld vertical in the background. The antenna was a breeze to set up and take down. It worked like a champ for us. Yours truly operating. Photo by Dominic, N5TCB. Sunday when we go to the dock, we had a visitor. 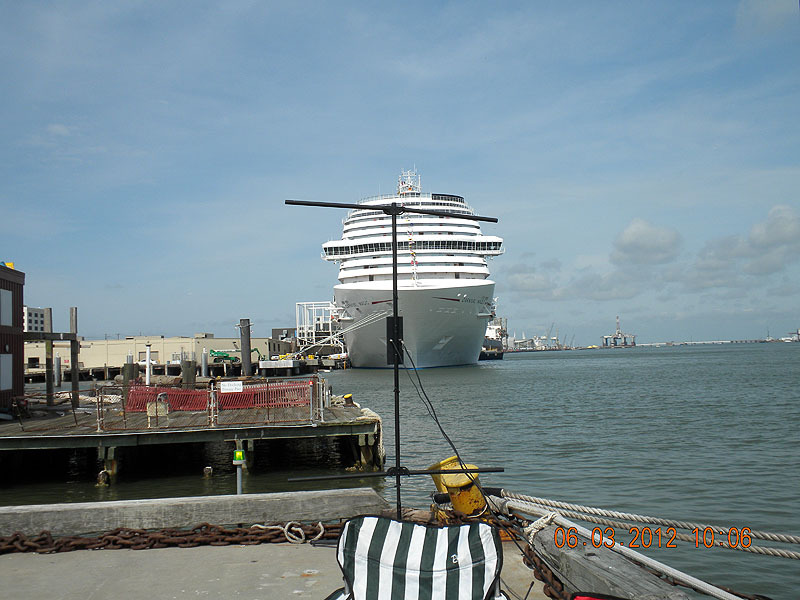 One of the carnival cruise liners had docked overnight and was in the process of loading up to leave port. You get a better view of the vertical antenna in this shot. A black and white photo showing the antenna and the cruise liner. Photo by Dominic, N5TCB. 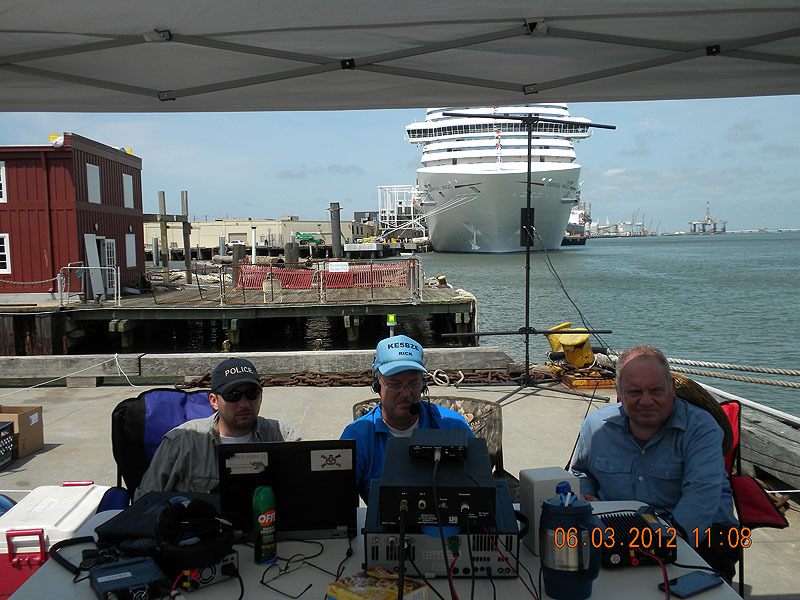 In this photo, from lest to right: Jeremy, K0JCC logging for Rick, KE5BZE with Dominic, N5TCB observing. The pileups seemed to start instantly when we called QRZ. They were often a huge, buzzing mass of noise with an occasional syllable coming through. When we could make out what seemed like 2 letters that went together, we called for the station. At times the QRM was very tough. My hat is off to the operators, to a man they did a good job. Here is a short video of Jeremy, K0JCC operating. And here is one of Rick, KE5BZE operating. We are hopeful that putting the Elissa on the air for museum ship weekend will become an annual event. We are quite pleased with how the activation went. There were many people who we could not work. Sorry, we tried to pick up all we could hear. Hope to work you next year. 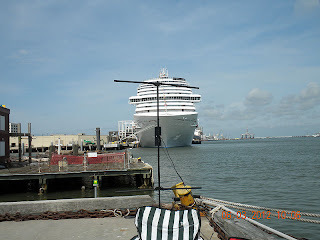 Logs have been uploaded to LOTW and forwarded to the New Jersy Battleship Amateur Radio Club and the Brazos Valley Amateur Radio Club as of 6/10/1210. heard you guys saturday am on 20. very good signal. i was only able to get about 15 watts, so my signal didn't make it. next time. Thanks for stopping by and saying hello. Sorry we were not able to make contact. The Saturday morning pileup was the largest I have ever experienced. Hope to work you next time. very 73 to you and yours. International Traffic outside VE and XE. It helped somewhat with QRM. But we did have a few people who need a class with Miss manor because they were tuning on top of us, or saying they were having a net. But 99.9% were great. Maybe next year we will be on more bands, and open for a longer period of time. The tuning up will always be an issue I think. What always gets me is when you call for someone who has a 9 in their call, for example, and you get the people who have a 2 or or 3 or 4 in their call coming back to you. HI. Listen first, then call. I did catch the "cycle." I think you and everyone else did very well overall. I put the island on the air on a constant basis and I contest. I had never experienced the type of pileups we had with N5E. It was a boatload of fun as far as I am concerned. Dom, I am glad you were there. 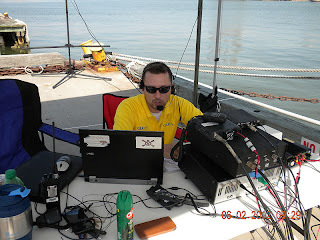 I had the pleasure of working N5E on 06/02 on 17M. Do you have QSL cards printed up for the event and if so who is the QSL manager. Working the weekend event was a lot of fun and I am looking forward to working it next year. Thanks to all of you for being there to make the event such a success.